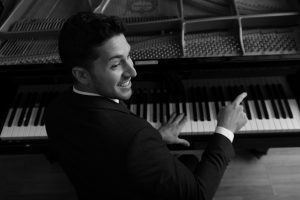 Recognized as a prodigy who began playing at age three, multifaceted American jazz pianist and composer Emmet Cohen has emerged as one of his generation’s pivotal figures in music. Downbeat observed that his “nimble touch, measured stride and warm harmonic vocabulary indicate he’s above any convoluted technical showmanship. Instead, the dalliances with rapid-fire notes and recurring chord bundles seem a product of youthful enthusiasm and in-progress maturation.” He has already shared the bandstand with Christian McBride, Joshua Redman, Patti Austin, Maceo Parker, Billy Hart, Anat Cohen and others. To learn more about Emmet Cohen, click here. Enjoy two sets with your purchase of a $35.00 combo ticket. Veronica Swift takes the stage at 8:30pm. For directions, public transportation and parking information, please visit our website. Click here for a complete calendar of Jazz Fest events.